Better ergonomics is just around the bend, of the keyboard tray, that is. Enjoy a tray that houses natural or curved keyboards with the Humanscale 100 Combo Keyboard Tray, which allows you to engage in negative tilt keying for more comfort. Working within your Neutral Reach Zone is crucial to your health; sit too long in the wrong position and you'll see what we mean. When you need the keyboard brought closer to you, the customizable Humanscale 100 Combo Keyboard Tray is your go-to desk accessory to assist you in better typing. The tray attaches to most desks and can be customized with accessories that meet your unique workstation needs. The Humanscale 100 Combo Keyboard Tray is only available in Black. 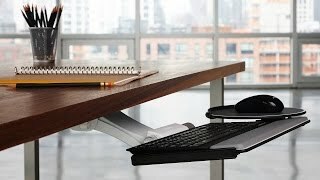 The Humanscale 100 Combo Keyboard Tray can be ordered with palm rests for additional support while typing and mousing. Humanscale palm supports are available in black only. The Humanscale 300 Curved Keyboard Tray can be ordered with a mouse pad to fit any of the available mousing platforms. A second mouse pad can be ordered with the Humanscale 100 tray for configurations utilizing two mouse platforms. The keyboard tray tucks neatly underneath my work desk, has good forward tilt and the mousing surface is very comfortable and roomy! This is an excellent keyboard tray, and the buying options letting me pick and choose the components was a great feature. On the positive side, this was relatively easy to install (although does require laying on your back under the desk with a drill and screwdriver, but that would be the case with any keyboard tray) and definitely gives the impression of a tray that will last for many years. I installed it on a brand new, custom made executive desk, and am not disappointed. It is easy to adjust, and lets me qickly move the keyboard to a comfortable height. On the negative, there were some shipping delays and it took a couple of weeks to arrive. When it did arrive, the mouse tray was pre-attached to the keyboard tray, but they put it on upside down -- however, that only took a couple of minutes to fix, so not really a big deal. The package included almost double the parts needed, I think because they have enough screws for every add-on you might get. That made it a little harder that it could have been to figure out which screws were the ones I needed, but again not really a big deal. All told, I'm pleased with the purchase and would buy it again. $269.00 List Price: $390.00* The list price is the same as the MSRP (Manufacturer's Suggested Retail Price). It may not necessarily be the price at which the product is sold.